Discussion in 'Tilted Philosophy, Politics, and Economics' started by ASU2003, Mar 1, 2015. Another day, another nail in the coffin that the left's former liberal and anti-racist values are currently spinning in. Representative Ocasio-Cortez has hitched her wagon to a group of people who openly praise a Hitler-loving holocaust denier as the "greatest of all time" and ranted (like members of this forum) about the Protocols inspired conspiracy of a nefarious Jewish plot in the media. A movement so rife with virulent and naked jew hatred that its own far left founders have called for the expulsion of its leadership and even the far left such as Emily's List have cut ties with it completely. There's a reason that 80% of Americans on average, even more if you look at minorities instead of whites, will openly say that social justice ideology is a serious problem facing the country. There's a reason that reality has finally caught up with even the once untouchable golden brand name of "Feminism" with >55% of women now openly rejecting it and calling it what it is. It's because people who are not part of the fanatic fringe movement that's come to believe its own monopoly on discourse see absolutely rampant galloping antisemitism and violent racism for what it is and don't fall for the plaintive cry that "antisemitism is right wing!! 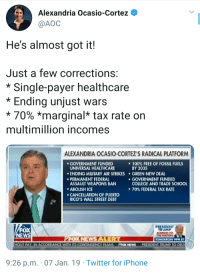 !11"
It is fascinating to follow the growing right wing obsession , led by Fox News where she is attacked on a daily basis, with new congresswoman Alexandria Ocasio-Cortez, and how she is playing them masterfully. Single-payer healthcare: A majority of Americans support "Medicare for All" type health care...some dont like when it is referred to as "single payer" but like the concept. Ending Unjust Wars: A policy that brings together the far left, the left-center and the libertarian right or, in other words, everyone but the Republican war hawks. She just has to be careful. Conservatives have a bad habit of assassinating left-wing figures they don't like in this country and around the world. The left attempts to start leaderless movements as a result, and they aren't nearly as effective. Now let's poll Americans on how they feel about holocaust denial, centuries old anti-jewish conspiracy theories, and praising Hitler as a "Great Man" because that's also a major part of AOC's platform given she just openly partnered with people who do all of that. Just goes to show the degree to which the left has normalized naked jew hating while simultaneously cynically using the very Jews they victimize as props in their smears on others... including actual Jews. That has certainly been the case since Trump took office. The Trump supporter who threatened to kill Boston Globe reporters because Trump said media that criticizes him are the "enemy of the people"
Criticizing Trump may be hazardous to one's health, in part, because it appears at times at Trump rallies that he condones violence against critics or makes remarks that unstable supporters might take as condoning violence. Fact Check: Did Donald Trump Encourage Violence at His Rallies? True. Thanks Redux, I'm glad to see someone bringing evidence of the obscene double standards at work here where no matter how racist and violent someone gets on the left there's no media storm and often no consequences at all. 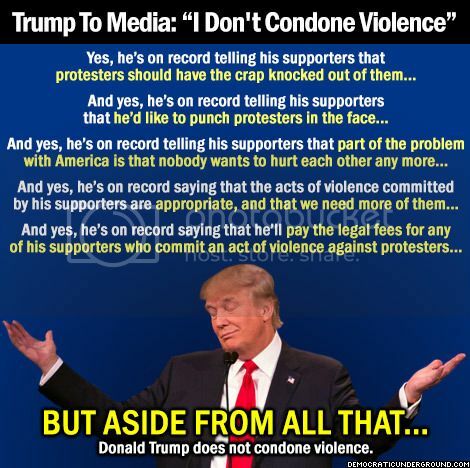 I'm glad to see people finally drawing attention to how Trumps supporters were literally being taken away by EMTs covered in blood from the sheer amount of violence they faced just for attending his rallies and yet what the media chooses to report are lies and half-truths about Trump telling his supporters not to be afraid to defend themselves from attacks like that. I'm also glad to see someone finally coming around to recognize how everyone remotely right wing gets spun by media sensationalism into a representation of every Trump supporter and Trump himself as if they were acting on direct orders, while things like Ricin sent to Trump are all but unreported on and literal months long street wars by massive armed mobs are either subjected to a media blackout or turned into flat out lies and propaganda where the massive unprovoked violence by enormous heavily armed mobs is recast as peaceful and innocent victimhood. It's incredible the degree to which left wing violence, no matter how severe, how widespread, how heavily armed, how unprovoked, leads to virtually no consequences for the perpetrators. It's also great to see you bringing up the unreliability of a website so fanatic, so fantastically prejudiced, that they'll claim something is "false" even when its indisputably on live video as long as it suits their fringe left agenda. More virulent, mainstream, widely defended and accepted, utterly naked and shameless jew hatred from a beloved left wing public figure. And as usual more complete silence or vocal defense from the left, who are ostensibly so obsessed with antisemitism they see the need to form uniformed paramilitary groups to wage street wars over it. Naturally the Washington Post, like the New York Times and literally all the rest of the media, is part of the same vast global Jewish Conspiracy that Congresswoman Omar is openly tweeting about. The one that's also a right wing nazi conspiracy according to the repeated public statements (conveniently deleted by admins to make the evidence go away) of our resident simultaneously obsessed with nazis and yet also rampantly antisemitic conspiracy theorist.
. ... The one that's also a right wing nazi conspiracy according to the repeated public statements (conveniently deleted by admins to make the evidence go away) of our resident simultaneously obsessed with nazis and yet also rampantly antisemitic conspiracy theorist. Making false accusations about a "resident" here AGAIN and falsely accusing the admins of "making it go away" AGAIN? It was correct to condemned Congresswoman Omar for the ignorant stereotype and anti-Semitic trope about Jews and the influence of money... for which she apologized. She should not be condemned for comments about Israel and its policies towards Palestinians or for supporting BDS nor should be threatened as she has been by House minority leader McCarthy (R-Calif). Many on the right, either ignorantly or intentionally, make the false characterization of any criticism of Israel (or AIPAC) as anti- Semitic and use such a tactic as a means of attempting to intimidate and silence those critics. We see that far too often from the American right and from Netanyahu's supporters in Israel. There is nothing more to say about the above post #148 other than that it follows in that pattern. Ah yes, Glenn Greenwald. One pathologically obsessed antisemite defending another. And of course there's nothing wrong with supporting BDS. After all what human rights loving, freedom supporting, racism opposing, sexism fighting feminist wouldn't support an organization founded by escapees of the largest terrorism funding bust in US history who openly praise and support suicide bombing, openly calls for genocide, and is funded by and supportive of regimes that treat women like property while selling blacks in open air slave markets. No nothing wrong with the BDS movement and its long history of violence and naked jew hating at all. "The main bill was approved, 23-15, along party lines, sending it to the House floor. It would expand required checks to all firearm sales, aimed at covering sales at gun shows, online or in other private settings. The second bill, which would extend the time firearms dealers must wait for a response from the system before making a sale, among other provisions." Much of it is relatively straight-forward progressive goals; some are out their in the realms of European socialism . The Social Security bill and gun control bill are likely to pass in the House and then stall in the Republican Senate and never reach Trump's desk. The Green New Deal may result in an infrastructure bill as a first step. But these bills will put both parties on the record on these popular issues going into the 2020 election. Personally, I think another universal check should be voting rights. Hey, it's most often voting for federal roles, take the checking responsibility out of the states hands into the fed's. This way it would be a level playing field, no matter where you lived. Bonus, it would re-enforce the census. The first bill the House Democrats introduced in January, H.R. 1, included significant voting reform (along with lobbying reform and ethics reform). Improve Access – H.R. 1 expands access to the ballot box by taking aim at institutional barriers to voting, such as cumbersome registration systems, limited voting hours and many other roadblocks. H.R. 1 creates automatic voter registration across the country, ensures that individuals who have completed felony sentences have their full rights restored, expands voting by mail and early voting and modernizes the U.S. voting system. Promote Integrity – H.R. 1 fights back against the conservative assault on voting rights by committing Congress to build the record necessary to restore the Voting Rights Act, prohibiting voter roll purges like those seen in Ohio, Georgia and elsewhere and ensuring that discriminatory voter ID laws do not prevent Americans citizens from exercising their rights. H.R. 1 also ends partisan gerrymandering to prevent politicians from picking their voters and making Americans feel like their voices do not count. Ensure Security – H.R. 1 ensures that American elections are decided by American voters without interference by foreign adversaries. The bill enhances federal support for voting system security, particularly paper ballots, and increases oversight over election vendors. It also included a provision to make election day a federal holiday as in many countries and required all presidential candidates to release their tax returns. Senator Majority Leader Mitch McConnell described the bill as a "power grab." I am kind of disappointed in the "Green New Deal". Not that it isn't a good goal, but that environmental groups have been slacking for the past 20 years in coming up with actual policies that would cut CO2 emissions by 55% in 4 years. The Kyoto and Paris agreements were the same non-binding stuff. I think the Green Party's "Green New Deal" from 2016 had a few more details, and if Hillary would have made a deal with Jill Stein to implement it with her as EPA administrator, we would be a lot better off. Thank you for the heads up, I missed this. And McConnell is only worried about grabbing power back for his party and agenda. There is not an ounce of integrity in him. Hopefully, it will go through...but he'll never let it through with the vice grip he keeps the Senate in. Promote Integrity – H.R. 1 fights back against the conservative assault on voting rights by committing Congress to build the record necessary to restore the Voting Rights Act, prohibiting voter roll purges like those seen in Ohio, Georgia and elsewhere and ensuring that discriminatory voter ID laws do not prevent Americans citizens from exercising their rights. @redux I'm curious: Do you consider that any voter ID law would be discriminatory? I think the few states that have strict and mandatory PHOTO voter ID laws may be discriminatory depending on the type of photos permitted (e.g. university student photo IDs not acceptable) and other factors (cost and accessibility of PHOTO ID) . In the majority of states, the voting ID can be either a permitted PHOTO ID (drivers license or passport) OR two other means of ID (Social Security card and a utility bill or bank statement with current address). There is no issue of discrimination when that option is available. In about a third of the states there are no ID requirements at all to vote; there may be requirements the first time a person registers to vote. There is no evidence that states with strict and mandatory PHOTO voter ID laws result in less voter fraud. In fact, there is no evidence of any widespread voter fraud anywhere, despite claims by Trump and some Republicans to justify the mandatory PHOTO IDs. There may be evidence from recent studies that strict and mandatory PHOTO voter ID laws result in voter suppression or lower voter turnout, particularly among the elderly and young minorities. Ultimately, I would like to see every state adopt a voting system similar to Oregon where all voting is by mail only. There are no physical polling places and Oregon typically is among the states with high "turnout" and no evidence of voter fraud. It may be that many college/university students are not legally residents of the university town where they live and attend school. I know that when I was an undergrad I always voted in my home town 180 miles away. I wonder if there are or should be safeguards to avoid students registering and voting twice? I had to show ID and the mentioned proof of address when I registered here in Nebraska. They also asked if I was a citizen of the US, but took my word for it, I guess. I needed no proof. When I vote the polling place asks first for my street address and then my name. If they match apparently no further ID is needed. Absence of evidence is not evidence of absence... But it seems to me that it would take a huge amount of fraud to have any effect on electoral outcomes. It seems to me that unless it were both widespread and co-ordinated voter fraud would be very difficult to detect. It would also most likely be completely ineffectual. "...may be evidence... sounds like one of those correlation does not equate with causation. "is associated with" may (or may not) mean something. Voting can be somewhat of a social occasion here. I vote at a UCC Church which always has coffee and cookies along with the "I Voted Today" sticker in a room away from the actual polling place. I usually see some neighbors or acquaintances when I vote. Older folks especially seem to enjoy the social interaction. Last November I was voter #274 fairly early in the day. A good turnout. Polling places are open for 12 hours here (8-8 central, 7-7 mountain time in Western Nebraska) and the State Election Commissioner's policy is not to close if there are still people waiting in line. Mail only voting would seem to inject sterility into a lively electorate. There's more to voter participation than the voting act itself. Until there are multiple weeks of voting at every polling location, one thing the vote by mail remedies is the last minute attack ad blitz by large super PACS and special interest groups. Even if they make claims that aren't true, the other candidate doesn't have time to craft a response and get it out to a distracted populace.